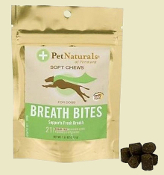 This category has everything you need to combat bad dog breath. Choose from a wide selection of high quality remedies that use natural ingredients to reduce, prevent and destroy plaque and tartar on dog's teeth. Many of these products also promote a healthy digestion and neutralizes intestinal acids that cause bad mouth odors. We provide a selection of dental sprays, mouth washes, chews, treats, tooth brushes, tooth paste, and supplements that promotes good breath in dogs.